Portland Diamond Project wants to bring major league baseball to Portland - along with a 32,000-seat stadium. The group working to bring a Major League Baseball team to Portland is trying to do something that hasn't been done in recent memory — build a new baseball stadium in an existing city instead of a suburb. "It's a heavy lift, but I believe we can do it," says Mike Barrett, managing director for the Portland Diamond Project, which has signed an agreement to purchase Terminal 2 from the Port of Portland. The 45-acre terminal, which is located at 3556 N.W. Front Ave., has been underused for years. Barrett's group has announced plans to build a 32,000-seat stadium on the site in hopes of securing either an MLB expansion team or buying an existing team that needs a new stadium. Both the Oakland Athletics and Tampa Bay Rays are currently looking for new stadiums. Barrett believes such a stadium would encourage development in the area, including additional investments by the stadium owners. He points to the example of the Atlanta Braves, which moved from Turner Field in Atlanta to the new SunTrust Park stadium in unincorporated Cobb County, Ga., in early 2017. The team helped finance the new stadium and associated developments. "The Atlanta Braves set the bar and we're trying to learn from them and top it in an urban setting," says Barrett. Barrett was speaking at the Wednesday, Dec. 19, Portland Business Alliance breakfast forum. He was part of a panel entitled "A Winning Economy: Professional Sports in the Rose City." 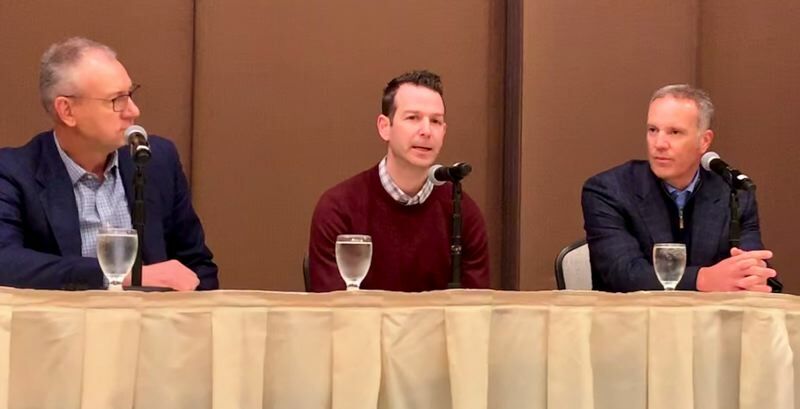 The other panelists were Cory Dolich, senior vice president for business operations and management for the Portland Timbers, and Jim Etzel, chief operating officer of the Oregon Sports Authority, which promotes sports to boost the state economy. Barrett's group has estimated the cost of building the stadium at $1 billion and the cost of acquiring the team at another $1 billion. He says the group is not asking for city funds for construction of the stadium. City funds will probably be required to upgrade the public infrastructure in the area, however, including improving Front Avenue to help handle the traffic expected to be generated by the games. According to Barrett, the city's investment would be justified by the economic benefits of the games, including additional hotel and motel bookings, and by providing Portland residents greater access to the river — even when the stadium is not being used. "For a city with a river running through it, Portland has very few access points to it," Barrett told the gathering at the downtown Sentinel Hotel. Etzel confirmed that sporting events boost the economy. His organization is credited with generating $330 million in additional spending in the state during the past several years by helping to bring in such events as NCAA track meets. Etzel noted that the IndyCar races that returned to Portland last year after a long absence increased hotel and motel bookings over the normally lackluster Labor Day Weekday. The races are coming back to Portland International Raceway during the 2019 Labor Day Weekend. Dolich said that although some might worry about the additional traffic generated by games, there are now so many transportation options, those attending Portland Timbers and Portland Thorns games in Providence Park do not overwhelm the neighborhood. Among other things, Dolich noted that stadium has 500 parking spaces for bikes that fill up on game days. Barrett said his group is already planning for a large area for "bike tailgate parties," and is talking to a number of people interested in starting water taxi companies. 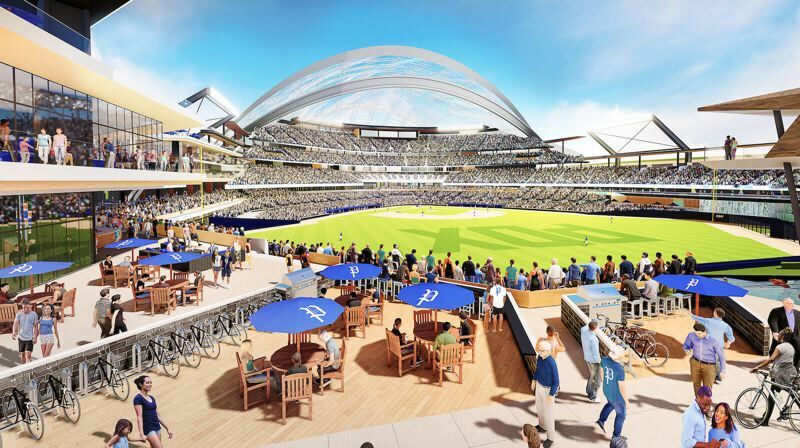 Mayor Ted Wheeler has already said the ballpark would have a positive impact on the economy, while shaping the next great Portland neighborhood. It is already being redeveloped, with apartment buildings filling in the area between the Steel Bridge and the former Terminal 1 site just to the south of Terminal 2. The port sold it to the city several years ago for a staging area for the Big Pipe project that has reduced combined sewage overflows in the river. Lithia Motors then bought it from the city to consolidate its automotive operations in the Portland area. Barrett did not say what might happen to that property, but it would be obvious location for more intensive development if the stadium is built. Barrett, Dolich and Etzel all said there are more than enough sports fans in the Portland area to support a Major League Baseball team without taking any away from the other professional teams here, including the Portland Trail Blazers. In fact, Barrett said his group's consultants say Portland is largest metropolitan area in the country with so few professional teams. "You are living in the most underserved sports market in the country," Barrett told the alliance members. Portland previously had its own Triple-A minor league baseball team, the Beavers. The latest incarnation of that team moved to El Paso, Texas, after the 2010 season. The nearest professional baseball team to Portland is the Hillsboro Hops, a Class A Short Season affiliate of the Arizona Diamondbacks. The Hops, formerly known as the Yakima Bears, came to Hillsboro in 2013 and have been widely embraced by baseball fans in Washington County and beyond. About 40 miles to the south of Portland is another minor league team, the Salem-Keizer Volcanoes. A Class A Short Season affiliate of the San Francisco Giants, the Volcanoes have been playing in Keizer since 1997. At present, Portland officially falls within the Seattle Mariners' "home territory," as defined by Major League Baseball. The most recent instance of a major league team moving into the home territory of another franchise was in 2005, when the Montreal Expos moved to Washington, D.C., and became the Washington Nationals. Such moves can be contentious and even have long-term consequences. The Nationals, Major League Baseball and Baltimore Orioles, which had previously included the Washington, D.C., area in its home territory, have been embroiled in a legal dispute over television rights for years. Mark Miller contributed to this report.